Aim : To assess the biocompatibility of two endodontic pastes based on calcium hydroxide and propolis, using two vehicles - non-fractionated Copaiba-oilresin (A) and volatile fraction of Copaiba-oilresin (B), in the connective tissue of rats. Materials and Methods : Fifteen rats had four polyethylene tubes implanted in their backs; each pair of tubes contained one of the pastes. The tube side was considered the control. After 7, 21, and 42 days, the animals were euthanized. Results : The inflammatory reaction was moderate at seven days for A and severe for B. At 21 days, it was slight for A and moderate for B; and at 42 days, it was slight for A and B. Tissue reaction ranged from slight (7 / 21 days) to no inflammation (42 days) for the control group. Statistical analysis (Kruskal-Wallis test, P < 0.01) demonstrated no significant difference between the pastes and control group (P > 0.01). Conclusion : Both pastes presented satisfactory tissue reaction in the connective tissue of rats. Endodontic infections are caused by opportunistic microorganisms that may invade a root canal containing necrotic tissue and establish an infectious process. , Although instrumentation and the use of irrigating solutions with antimicrobial activity remove a majority of the microorganisms in the root canal, it has been shown that a small part of the flora survives. Under clinical conditions, a biomechanical preparation does not completely eliminate the microorganisms present in the root canal system; therefore, the action of an intracanal medication with effective antimicrobial activity is necessary. One of the materials that has been widely used for this purpose is calcium hydroxide, due to its properties. In view of all the features described, the association of calcium hydroxide, propolis, and the Copaiba-oilresin could be a feasible alternative for intracanal medication. Thus, the aim of this study is to assess the biocompatibility of the two calcium hydroxide / propolis-based pastes, using various vehicles, namely non-fractionated Copaiba-oilresin (Paste A) and the volatile fraction of Copaiba-oilresin (Paste B), by means of the morphological and morphometric analyses of the reaction caused in the connective tissue of rats. The components of the pastes [Table 1] were manipulated and the polyethylene tubes were immediately filled with them, using a lentulo spiral (Dentsply-Maillefer, Ballaigues, Switzerland). Fifteen young adult male rats (Rattus novergicus, Albinus, Holtzman), weighing between 200 and 250 g were used. The animals were kept in a temperature-controlled room (12 hours light / 12 hours dark; at a temperature of 21 - 25°C), in plastic boxes (40 x 32 x 17 cm), receiving balanced rations (Nuvilab, Colombo, PR, Brazil) and water ad libitum. For the subcutaneous implant procedure, the animals were anesthetized with 10% Ketamine Chloride solution (75 mg/kg) along with Xylazine (10 mg/kg) (Dopaser, Calier S/A, Barcelona, Spain), administred intraperitoneally. Each animal received four tubes containing the tested materials, two being in the scapular region and two in the pelvic region. Each pair of tubes represented a distinct group. The lateral side of the tube was considered the control group. After 7, 21, and 42 days, the rats were euthanized by an anesthetic overdose and the tubes removed for histological analysis. Thus, there were five rats for each studied period, totaling to 10 samples for each experimental group in each one of the periods (n = 10). The samples were processed for conventional histopathological examination. The connective tissue adjacent to the open-end of each tube was sectioned at a microtome setting of 5 μm and stained with hematoxylin and eosin. Histopathological analysis was performed under a light microscope (Carl Zeiss, Oberkachen, Germany) at 100 / 200X magnification, based on the tissue responses stimulated by the tested materials and the control group. The events assessed were: inflammatory infiltrate (polymorph nuclear and mononuclear cells), cellularity and vascularization (fibroblasts and blood vessels), and macrophagic activity (macrophage and inflammatory giant cells). To quantify the events, the software Image Toll was used (UTHSCSA, San Antonio, TX, USA). According to these features, a grading from I to IV,  was used to grade the inflammatory reaction: Grade I - chronic inflammatory cells (no inflammation); Grade II - infiltration of inflammatory cells and collagen fiber deposits and fibrosis (slight); Grade III - dense infiltration of inflammatory cells, tissue edema, and vascular congestion (moderate); Grade IV - dense infiltration of acute and chronic inflammatory cells, edematous areas, and vascular congestion with fibrin deposits (severe). The amplitude of the fibrous capsule (mm 2 ) was measured using the software AxioVision (Carl Zeiss). Once the various components of the events were quantified and the fibrous capsule amplitude measured, the values obtained were submitted to a non-parametric statistical analysis (Kruskal-Wallis test, P < 0.01). In general, the tissue elements identified were similar in all fragments: connective tissue of variable density, with a slight lymphoplasmocytic inflammatory infiltrate and capsular arrangement at the interface with the material or side of the tube [Figure 1], without a statistically significant difference between the pastes, when compared in the same period of analysis (P > 0.01). When the different periods of analysis were compared, there was a statistically significant difference (P < 0.01) [Table 2] and [Table 3]. Figure 1: Histological images. (a) Moderate inflammatory reaction caused by Paste A, at seven days, in an area representative of the capsule, at the tubular opening (Grade III). (b) Severe inflammatory reaction caused by Paste B, at seven days (Grade IV). (c) Slight inflammatory reaction caused by paste A at 21 days, (Grade II). (d) Moderate inflammatory reaction caused by paste B, at 21 days, (Grade III). (e) Slight inflammatory reaction caused by the paste at 42 days (Grade II). (f) Slight inflammatory reaction caused by Paste B at 42 days (Grade II). (Hematoxylin-Eosin, 100 and ×200). In the initial period of seven days, there was a connective tissue with delicate fibers, high cell content, and recently formed blood vessels, adjacent to all examined surfaces. On the side facing the materials, the fibrous capsule showed a mean size of 1.332 mm2 for Paste A and 1.478 mm 2 for Paste B, with no statistically significant difference (P > 0.01). Whereas, on the side facing the polyethylene tube (control), the deposition of a delicate sheaf of connective fibers was noted, arranged in parallel mode in a capsular arrangement, but without the formation of a capsule. The inflammation grade stimulated by the pastes was moderate (III) for Paste A and severe (IV) for Paste B in this period. The period of 21 days showed the organization of a fibrous capsule of variable thickness around the polyethylene tube area. The fibrous capsule that formed in the region, in contact with Paste A (0.798 mm 2 ), was significantly smaller than the fibrous capsule that formed in the region in contact with Paste B (1.037 mm 2 ). This trend continued in the period of 42 days: Paste A (0.623 mm 2 ) and Paste B (0.987 mm 2 ), but without any statistically significant difference (P > 0.01). With regard to the inflammatory response, there was a maximum of Grade II (slight) response to Paste A and III to Paste B (moderate) after the period of 21 days, and Grade II response to both pastes after 42 days, which was acceptable in terms of biocompatibility. There are more than 20 species of the Copaifera genus in Brazil, which provide oils that differ significantly in chemical composition. The main constituents of these oils are sesquiterpenes and diterpenes. Although different activities have been reported and a variety of substances have been identified, little is known about the relationship between the structures and activity of the components, and their biocompatibility. In the course of time, these histopathological events decreased, reaching the final period of observation (42 days), showing the formation of a fibrous / dense tissue surrounding the polyethylene tube that had been implanted. In the area adjacent to the tube, collagen fibers with fibroblasts were observed, with minimal presence of inflammatory cells. The absence of necrosis and degeneration of the collagen were also observed. The tissue repair that occurred at the tubular opening was very similar to that on the surface, at the side of the tube, as described by Shahi et al. Despite the positive results found in this study, it should be noted that other tests should be conducted before applying this material in humans. Although the subcutaneous tissue of rats does not faithfully reproduce the conditions of the pulp and periapical tissues, the test is a simple method to identify tissue reactions, and the results show that both tested pastes are biocompatible to the subcutaneous tissue of rats. 1. Siqueira JF Jr, Rocas IN, Lopes HP. Patterns of microbial colonization in primary root canal infections. Oral Surg Oral Med Oral Pathol Oral Radiol Endod 2002;93:174-8. 2. Sassone LM, Fidel RA, Murad CF, Fidel SR, Hirata R Jr. Antimicrobial activity of sodium hypochlorite and chlorhexidine by two different tests. Aust Endod J 2008;34:19-24. 3. Evans MD, Baumgartner JC, Khemaleelakul S, Xia T. Efficacy of calcium hydroxide: Chlorhexidine paste as an intracanal medication in bovine dentin. J Endod 2003;29:238-9. 4. Fava LR, Saunders WP. Calcium hydroxide paste: Classification and clinical indications. Int Endod J 1999;32:257-82. 5. Leonardo MR, Silva LA, Tanomaru-Filho M, Bonifácio KC, Ito IY. In vitro evaluation of antimicrobial activity of sealers and pastes used in Endodontics. J Endod 2000;26:391-4. 6. Veiga Jr VF, Zunino L, Calixto JB, Patitucci ML, Pinto AC. Phytochemical and antioedematogenic studies of commercial copaiba oils available in Brazil. Phytother Res 2001;15:476-80. 7. Gomes NM, Rezende CM, Fontes SP, Matheus ME, Fernandes PD. Antinociceptive activity of Amazonian Copaiba oils. J Ethnopharmacol 2007;109:486-92. 8. Stupp T, de Freitas RA, Sierakowski MR, Deschamps FC, Wisniewski A Jr, Biavatti MW. Characterization and potential uses of Copaifera langsdorfii seeds and seed oil. 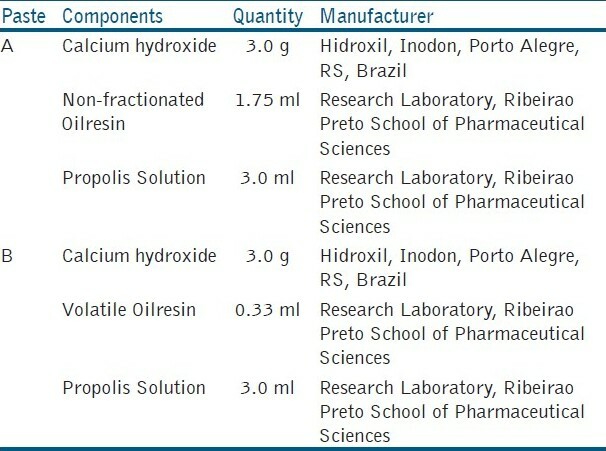 Bioresour Technol 2008;99:2659-63. 9. Santos AO, Ueda-Nakamura T, Dias-Filho BP, Veiga Junior VF, Pinto AC, Nakamura CV. Antimicrobial activity of Brazilian copaiba oils obtained from different species of the Copaifera genus. Mem Inst Oswaldo Cruz 2008;103:277-81. 10. Paiva LA, de Alencar CK, Santos FA, Gramosa NV, Silveira ER, Rao VS. Investigation on the wound healing activity of oleo-resin from Copaifera langsdorffi in rats. Phytother Res 2002;16:737-9. 11. Veiga Jr VF, Rosas EC, Carvalho MV, Henriques MG, Pinto AC. Chemical composition and anti-inflammatory activity of copaiba oils from Copaifera cearensis Huber ex Ducke, Copaifera reticulata Ducke and Copaifera multijuga Hayne--a comparative study. J Ethnopharmacol 2007;112:248-54. 12. Osete-Cortina L, Domenech-Carbo MT. Analytical characterization of diterpenoid resins present in pictorial varnishes using pyrolysis-gas chromatography-mass spectrometry with on line trimethylsilylation. J Chromatogr A 2005;1065:265-78. 13. Koo H, Vacca Smith AM, Bowen WH, Rosalen PL, Cury JA, Park YK. Effects of Apis mellifera propolis on the activities of streptococcal glucosyltransferases in solution and adsorbed onto saliva-coated hydroxyapatite. Caries Res 2000;34:418-26. 14. Koo H, Cury JA, Rosalen PL, Ambrosano GM, Ikegaki M, Park YK. Effect of a mouthrinse containing selected propolis on 3-day dental plaque accumulation and polysaccharide formation. Caries Res 2002;36:445-8. 15. Al-Shaher A, Wallace J, Agarwal S, Bretz W, Baugh D. Effect of propolis on human fibroblasts from the pulp and periodontal ligament. J Endod 2004;30:359-61. 16. Ferreira FB, Torres SA, Rosa OP, Ferreira CM, Garcia RB, Marcucci MC, et al. Antimicrobial effect of propolis and other substances against selected endodontic pathogens. Oral Surg Oral Med Oral Pathol Oral Radiol Endod 2007;104:709-16. 17. Ozan F, Polat ZA, Er K, Ozan U, Deðer O. Effect of propolis on survival of periodontal ligament cells: New storage media for avulsed teeth. J Endod 2007;33:570-3. 18. Gulinelli JL, Panzarini SR, Fattah CM, Poi WR, Sonoda CK, Negri MR, et al. Effect of root surface treatment with propolis and fluoride in delayed tooth replantation in rats. Dent Traumatol 2008;24:651-7. 19. Gopikrishna V, Baweja PS, Venkateshbabu N, Thomas T, Kandaswamy D. Comparison of coconut water, propolis, HBSS, and milk on PDL cell survival. J Endod 2008;34:587-9. 20. Estrela C, Pimenta FC, Ito IY, Bammann LL. Antimicrobial evaluation of calcium hydroxide in infected dentinal tubules. J Endod 1999;25:416-8. 21. Campos-Pinto MM, de Oliveira DA, Versiani MA, Silva-Sousa YT, de Sousa-Neto MD, da Cruz Perez DE. Assessment of the biocompatibility of Epiphany root canal sealer in rat subcutaneous tissues. Oral Surg Oral Med Oral Pathol Oral Radiol Endod 2008;105:77-81. 22. Moretti-Neto RT, Mello I, Moretti AB, Robazza CR, Pereira AA. In vivo qualitative analysis of the biocompatibility of different cyanoacrylate-based adhesives. Braz Oral Res 2008;22:43-7. 23. Shahi S, Rahimi S, Lotfi M, Yavari HR, Gaderian AR. A comparative study of the biocompatibility of three root-end filling materials in rat connective tissue. J Endod 2006;32:776-80. 24. Foreman PC, Barnes IE. A review of calcium hydroxide. Int Endod J 1990;23:283-97. 25. Holland R, Souza V. Ability of a new calcium hydroxide root canal filling material to induce hard tissue formation. J Endod 1985;11:535-4.
mendonça, i.c.g. and medeiros, m.l.b.b. and penteado, r.a.p.m. and parolia, a. and porto, i.c.c.m. dias-da-silva, m.-a. and pereira, a.-c. and marin, m.-c.-c. and salgado, m.-a.-c.
Arslan, H. and Sinan Topcuoglu, H. and Karatas, E. and Barutcigil, C. and Aladag, H. and Meltem Topcu, K.